The ISPE celebrated its 40th birthday in December, however, the celebrations were muted somewhat as we heard that John Dawes, Hon.FISPE, had passed away in late-November. John had served as the Technical Editor for the ISPE for many years and had spoken at numerous ISPE Seminars and ISPE Workshops at SPATEX. He was a familiar face at SPATEX during the Brighton years, and helped out on the ISPE stand every year, answering hundreds of questions from ISPE members and others, and giving many people the benefit of his vast experience on all matters relating to pools and spas. John contributed articles to virtually every ISPE Magazine and was also a technical author. His book, ‘The Design and Planning of Swimming Pools’ became the ISPE Handbook in the 1980s. 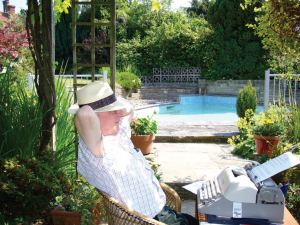 John was the author of the ‘SPidas’ (Swimming Pool industry directory and specifier) series of publications, collaborating with the ISPE in producing the ‘SPidas directory’ as well as the ‘SPidas Pool industry survey’, amongst other titles. In addition, John edited and helped produce the series of twenty two ISPE Technical Papers, many of which are still available today. It’s true to say that the ISPE would not be where it is if it hadn’t been for the enormous amount of help, advice and support given by John Dawes.